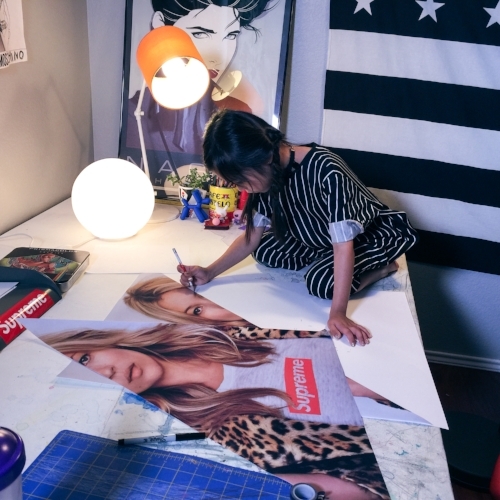 In case you missed it, on Sunday, March 26 we're hosting the first-ever LA show (and second-ever solo show) for Giana, a seven-year-old Filipina-Mexican American artist from Dallas. We first discovered Giana on Instagram when her inspiring mother, Gena Errisuriz, reached out to us to discuss ways to collaborate. It took just one look at her daughter's distinct talent and unique fashion sense to know that she's definitely our girl, and we wanted nothing more than to support this young pop-art phenom's future. Get to know Gena and Giana a little more below, and be sure to RSVP to the show here! What is your earliest memory of Giana creating art? I noticed Giana always enjoyed creating at the age of 3 and as a tiny toddler, I always gave her plenty of paper and crayons. She would spend hours scribbling, and at times I wanted her to run around and play, but she would not let me take away her crayons. Giana always spent lots of time stacking blocks with precision that resembled intricate buildings and she knew exactly how she wanted it to look. We have always taken Giana and Leo to art shows and we even have a video of her at three years old pretending she is having her own art show and showing us her work. It is crazy how at seven years old, everything has come full circle. What inspired the art show's name, "It's a Cool Cool World"? With all 3 of our kiddos, we try to keep them curious about their environment through exposure to the arts, different cultures, and allow them to explore the world around them. The title of her show just came very naturally, because to them, everything is a cool and new experience! What are your big dreams for Giana? My dream for Giana is for her to enjoy a life full of wonderful experiences and memories. I want her to find a passion and career in life that makes her happy. Although she loves art, she has always expressed her love for Science. I always tell her she can do it all! Fashion heavily influences Giana's art, which likely comes from you. Have you always loved fashion? I have always loved fashion and have a much bigger LOVE for personal style. As a young teenager I would go to Tower Books with my parents and look at all of the Japanese style magazines. It would blow my mind how they put together their outfits and got so creative with makeup and hair. I love how people can put together an outfit and make it truly their own. What are your favorite kids fashion brands for Giana? There are so many independent brands that I have such a love for. One brand that has been continuous for G is Leni and June. The designer and I have never personally met, but we have communicated through Instagram. She is super talented and has amazing pieces. FLAKIKI is another brand that I adore from Korea. She is very fashion forward and Giana always wants to wear her designs. Même is one of the first brands we ever collaborated with and her clothing definitely complimented Giana’s aesthetic. Of course, the Hey Babe! jacket is a head turner. Every time she wears her jean jacket she gets so many compliments. Haus of JR has really good staple pieces that look good with everything and Giana always says how comfortable the clothing is. The quality is unreal and the denim is out of this world. Doo Wop Kids, Le Future Kids, Average Brand, and girlstalktoboys are among our favorites as well. Giana has been given the opportunity to wear many brands from different parts of the world designed by such talented women. It is truly an honor and I am very grateful. Follow Giana on Instagram here.